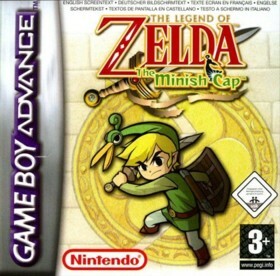 The Legend of Zelda: The Minish Cap is a Game Boy Advance game in the Adventure genre. The game was published by Nintendo and developed by Flagship and Capcom. The game has an ESRB Rating of E (Everyone 6+) and was released on 2005-01-10. The game's official site can be found at www.zelda.com/minishcap. Really fun action RPG...plus its Zelda! This game is Zelda reborn. I played this game for over 25 hours and I enjoyed every minute. The story involves the usual Link needing to rescue the princess (she is a stone statue due to an accident at the beginning of the game), but this time Link has the help of a race known as the "Picori". The game is the usual dungeon fare like previous Zelda games, but in this game the new gadget is the Minesh Cap...which allows Link to become really small. This cap is bestowed upon Link due to a Picori known as Ezlo. The Minesh cap will allow you to shrink and then return back to normal size using predetermined spots in the game (such as Tree Stumps etc). This mechanic is very fun.